Lucas Torreira's father, Ricardo Torreira, has sent the rumour mill running after he hinted at his son's exit from the Emirates in the future, with a return to Italy on the cards. 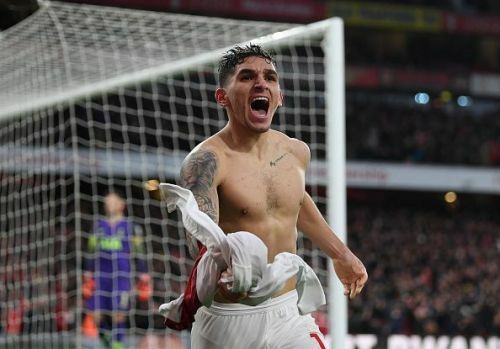 Since his arrival at the Emirates from Sampdoria, Torreira has emerged as a mainstay in Unai Emery's midfield, having made 29 appearances for Arsenal so far this season. The Uruguayan also won the hearts of the Gunners faithful with his bold performances and a well-timed goal in Arsenal's 4-2 win over arch-rivals, Tottenham Hotspur, earlier in the season. Before his move to Arsenal, the midfielder also drew the attention of Serie A outfit, Napoli, who were very close to acquiring his services. "It’s true, Lucas was very close to Napoli. There were negotiations with Napoli, but something strange happened, and you know in the transfer market things can change from one moment to the next." "Negotiations are long and complicated processes, so it can happen than they don’t go the way we expected. There was this opportunity to go to England and Lucas took it, so I have to say he is happy at Arsenal." "Obviously, Lucas is very fond of Italian football, where he grew up, and might return to Italy in future. You can never say never, so it’s possible he could come back to this marvellous country and, why not to Napoli or another club that makes an offer?" Arsenal will meet Napoli for the first leg of their Europa League quarter-finals on April 11. Meanwhile, the club will hope to earn a crucial three points from their Premier League clash against Newcastle United to keep their hopes of finishing in the top four alive. Arsenal Transfer News: Winger target reveals Gunners transfer talk "is very nice"